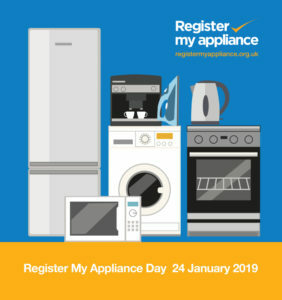 By taking just a few minutes to register your fridges, freezers, washing machines, dryers and cooking appliances ensures manufacturers can contact you if a safety repair is ever needed. Across the UK we rely on 170 million large appliances to handle our essential daily chores. Some families have as many as four freezers. They are often kept for many years, so it’s easy to forget whether they are registered or not. Yet here it is possible to register products that are at least 12 years old, all in one place. It’s quick and easy and recognised as a critical home safety precaution by Office of Product of Safety and Standards, the Home Office, Fire and Rescue services nationwide, consumer groups and many others.